From space (November 1994). North is to the left. Qinghai Lake (Chinese: 青海湖), Koko Nor (Mongolian: Хөх нуур) or Tso Ngonpo (Tibetan: མཚོ་སྔོན་པོ།) is the largest lake in China. Located in Qinghai province on an endorheic basin, Qinghai Lake is classified as a saline and alkaline lake. Qinghai Lake has a surface area of 4,317 square kilometres (1,667 sq mi); an average depth of 21 metres (69 ft), and a maximum depth of 25.5 m (84 ft) as measured in 2008. The current Chinese name "Qinghai," the older Mongolian name "Kokonor", and the Tibetan name translate to "Green Sea", "Blue Lake" and "Teal Sea", respectively. Qinghai Lake is located about 100 kilometres (62 mi) west of the provincial capital of Xining (Tib:Ziling ཟི་ལིང་།) at 3,205 m (10,515 ft) above sea level in a hollow of the Tibetan plateau. Twenty-three rivers and streams empty into Qinghai Lake, most of them seasonal. Five permanent streams provide 80% of total influx. The lake has fluctuated in size, shrinking over much of the 20th century, but has increased since 2004. There are five native fish species: The edible naked carp (Gymnocypris przewalskii, 湟鱼; huángyú), which is the most abundant in the lake, and four stoneloaches (Triplophysa stolickai, T. dorsonotata, T. scleroptera and T. siluroides). Other Yellow River fish species occurred in the lake, but they disappeared with the increasing salinity and basicity, beginning in the early Holocene, and eventually reaching the current salinity of c. 14 parts per thousand and pH of 9.3. Qinghai Lake became isolated from the Yellow River about 150,000 years ago. Qinghai Lake is sandwiched between Hainan and Haibei Tibetan Autonomous Prefectures in northeastern Qinghai. The lake is located at the crossroads of several bird migration routes across Asia. Many species use Qinghai as an intermediate stop during migration. As such, it is a focal point in global concerns regarding avian influenza (H5N1), as a major outbreak here could spread the virus across Europe and Asia, further increasing the chances of a pandemic. Minor outbreaks of H5N1 have already been identified at the lake. 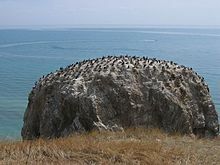 At the tip of the peninsula on the western side of the lake are the "Bird Islands" (Cormorant Island and Egg Island), which have been bird sanctuaries of the Qinghai Lake Natural Protection Zone since 1997. The lake often remains frozen for three months continuously in winter. There is an island in the western part of the lake with a temple and a few hermitages called "Mahādeva, the Heart of the Lake" (mTsho snying Ma hā de wa) which historically was home to a Buddhist monastery. No boat was used during summer, so monks and pilgrims travelled to and fro only when the lake froze over in winter. A nomad described the size of the island by saying that: "if in the morning a she-goat starts to browse the grass around it clockwise and its kid anti-clockwise, they will meet only in the night, which shows how big the island is." It is also known as the place where Gushri Khan and other Khoshut Mongols migrated to during the 1620s. The lake is circumambulated by pilgrims, mainly Tibetan Buddhists, especially every Horse Year of the 12-year cycle. Przhevalsky estimated it would take about 8 days by horse or 15 walking to circumambulate the lake, but pilgrims report it takes about 18 days on horseback, and one took 23 days walking to complete the circuit. In the Han Dynasty (206 BCE–220 CE), Qinghai Lake was called the West Sea (Chinese: 西海; pinyin: Xī Hǎi), and substantial numbers of Han Chinese lived in the Xining valley to the east. In the 17th century, Mongolic-speaking Oirat and Khalkha tribals migrated to Qinghai and became known as Qinghai Mongols. In 1724, the Qinghai Mongols led by Lobzang Danjin revolted against China's Qing Dynasty (1644–1912). The Yongzheng Emperor, after putting down the rebellion, stripped away Qinghai's autonomy and imposed direct rule. Although some Tibetans lived around the lake, the Qing maintained an administrative division from the time of Güshi Khan between the Dalai Lama's western realm (slightly smaller than the current Tibet Autonomous Region) and the Tibetan-inhabited areas in the east. Yongzheng also sent Manchu and Han settlers to dilute the Mongols. During Nationalist rule (1928-1949), Hans formed a majority of Qinghai Province's residents, although Huis ("Chinese Muslims") dominated the government. The Kuomintang Hui General Ma Bufang, having invited Kazakh Muslims, joined the Governor of Qinghai and other high ranking Qinghai and national government officials in conducting a joint Kokonuur Lake Ceremony to worship the God of the Lake. During the ritual, the Chinese national anthem was sung, all participants bowed to a Portrait of Kuomintang founder Dr. Sun Yat-sen, as well as to the God of the Lake. Participants, both Han and Muslim, made offerings to the god. After the 1949 Chinese revolution, refugees from the 1950s Anti-Rightist Movement settled in the area west of Qinghai Lake. After the Chinese economic reform in the 1980s, drawn by new business opportunities, migration to the area increased, causing ecological stresses. Fresh grass production in Gangcha County north of the lake declined from a mean of 2,057 kilograms per hectare (1,835 lb/acre) to 1,271 kg/ha (1,134 lb/acre) in 1987. In 2001, the State Forestry Administration of China launched the "retire cropland, restore grasslands" (退耕，还草) campaign and started confiscating Tibetan and Mongol pastoralists' guns allegedly in order to preserve the endangered Przewalski's gazelle. Prior to the 1960s, 108 freshwater rivers emptied into the lake. As of 2003, 85% of the river mouths have dried up, including the lake's largest tributary, the Buha River. In between 1959 and 1982, there had been an annual water level drop of 10 centimetres (3.9 in), which was reversed at a rate of 10 cm/year (3.9 in/year) between 1983 and 1989, but has continued to drop since. The Chinese Academy of Sciences reported in 1998 the lake was again threatened with loss of surface area due to livestock over-grazing, land reclamations and natural causes. Surface area decreased 11.7 percent in the period from 1908 to 2000. During that period, higher lake floor areas were exposed and numerous water bodies separated from the rest of the main lake. In the 1960s, the 48.9-square-kilometre (18.9 sq mi) Gahai Lake (尕海, pinyin: Gǎhǎi) appeared in the north; Shadao Lake (沙岛, pinyin: Shādǎo), covering an area of 19.6 km2 (7.6 sq mi) to the northeast, followed in the 1980s, along with Haiyan Lake (海晏, pinyin: Hǎiyàn) of 112.5 km2 (43.4 sq mi). Another 96.7 km2 (37.3 sq mi) daughter lake split off in 2004. In addition, the lake has now split into half a dozen more small lakes at the border. The water surface has shrunk by 312 km2 (120 sq mi) over the last three decades. ^ Zhang, Guoqing (2011). "Water level variation of Lake Qinghai from satellite and in situ measurements under climate change". Journal of Applied Remote Sensing. 5: 053532. doi:10.1117/1.3601363. ^ Buffetrille 1994, p. 2; Gruschke 2001, pp. 90 ff. ^ Rhode, David; Ma Haizhou; David B. Madsen; P. Jeffrey Brantingham; Steven L. Forman; John W. Olsen (2009). "Paleoenvironmental and archaeological investigations at Qinghai Lake, western China: Geomorphic and chronometric evidence of lake level history" (PDF). Quaternary International. 218 (1–2): 3. doi:10.1016/j.quaint.2009.03.004. Retrieved 2010-03-18. ^ a b c Zhang, Ludwig, Zhang, Tong, Li, Tang, Peng & Zhao (2015). Gymnocypris przewalskii (Cyprinidae) on the Tibetan Plateau. Scientific Reports 5, Article 9780. ^ Gruschke 2001, pp. 93 ff. ^ Buffetrille 1994, pp. 2–3. ^ Buffetrille 1994, p. 2. ^ "Climate: Qinghai Lake, China". Retrieved January 27, 2018. ^ "Climate: Qinghai Lake, China". Retrieved August 6, 2018. ^ a b c Harris, Richard B. (2008). Wildlife Conservation in China: Preserving the Habitat of China's Wild West. M.E. Sharpe. pp. 130–132. ^ Sanders, Alan (2010). Historical Dictionary of Mongolia. Scarecrow Press. pp. 2–3, 386, 600. ^ Perdue, Peter C (2005). China Marches West: The Qing Conquest of Central Eurasia. Harvard University Press. pp. 310–312. ^ Hutchings, Graham (2003). Modern China: A Guide to a Century of Change. Harvard University Press. p. 351. ^ Uradyn Erden Bulag (2002). Dilemmas The Mongols at China's edge: history and the politics of national unity. Rowman & Littlefield. p. 52. ISBN 978-0-7425-1144-6. Retrieved 2010-06-28. ^ Uradyn Erden Bulag (2002). Dilemmas The Mongols at China's edge: history and the politics of national unity. Rowman & Littlefield. p. 51. ISBN 978-0-7425-1144-6. Retrieved 2010-06-28. ^ Qinghai Lake splits due to deterioration. Chinadaily.com.cn (2004-02-24). Retrieved on 2010-09-27. Buffetrille, Katia. "The Blue Lake of Amdo and Its Island: Legends and Pilgrimage Guide." In: The Tibet Journal Vol. XIX, No. 4, Winter, 1994. "Koko-nor" . Encyclopedia Americana. 1920.